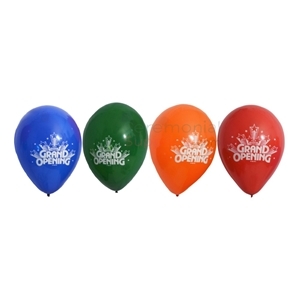 For those moments at your grand opening or groundbreaking which call for a dash of color, you will need these balloons. 11 inch size and bright colors will leave a mark on your guests. 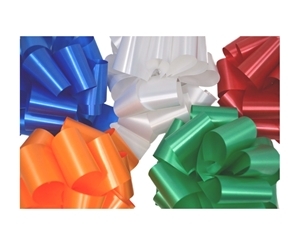 The package delivered to you will include a set of 10 balloons in a variety of distinctive colors such as red, blue, orange, and green. The right item to add a splash of color to your event, these balloons, which can be inflated up to 11 inches, will be just what you need. The set provided to you will include 20 latex balloons available in attractive colors such as red, blue, orange, yellow, and pink. The perfect item to add some color to your ceremony, these balloons are available in an attractively large size of up to 11 inches when inflated. 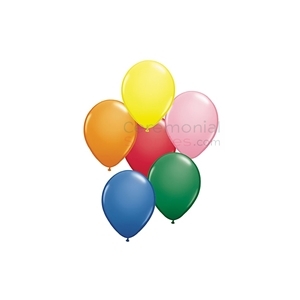 Your purchase includes a set of 10 balloons, with colors such as red, blue, orange, yellow, and pink. 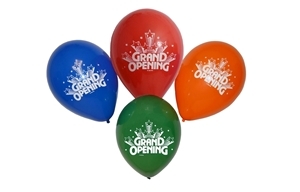 These 17 inch latex balloons are the perfect accessory to enliven your grand opening ceremony. 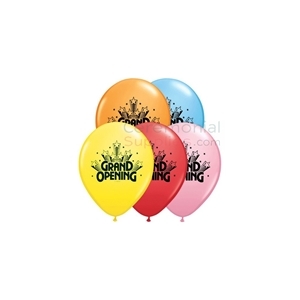 With included colors such as red, magenta, blue, yellow and orange included in this 10 pack and the words 'grand opening' printed on them, these balloons will ensure your ceremony's vividness. 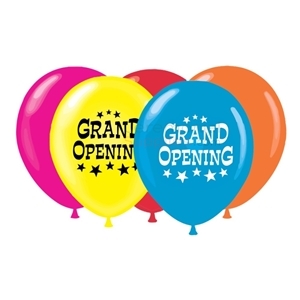 Measuring a perfect 18 X 18 inches, this squared grand opening balloon is as unique as a balloon can get. 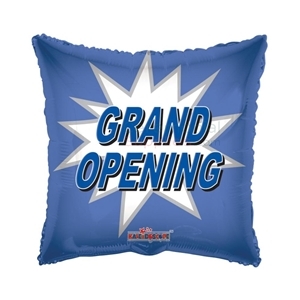 This huge balloon comes with the words 'Grand Opening' printed across it, thus making it an ideal prop for grand opening ceremonies and ribbon cuttings. 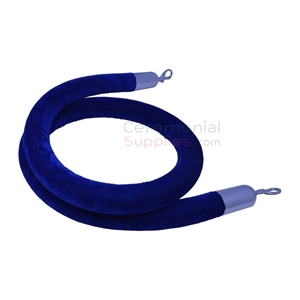 The balloon comes in an eye catching blue color that accentuates its square design. Featuring a black enamel pin design with a gold trim, this is an excellent alternative to a traditional looped ribbon pin. 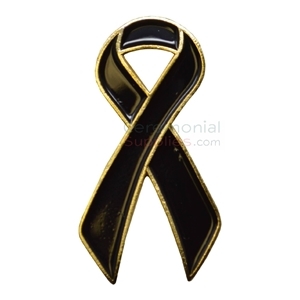 This lapel pin measures a compact 0.625 inches by 1.125 inches with a friction pin clasp back, this makes for an excellent item to show your support for a cause. Featuring a golden trim on a blue enamel pin, this small Blue Ribbon Support Lapel Pin measures 0.625 inches by 1.125 inches. It is an excellent accessory to show your support for a cause or to raise awareness about a certain disease or a condition. The pin comes with a friction back pin clasp for easy attachment. With its nifty 1.75 inch by 0.375 inch size and attractive gold or silver finish (depending on your preference), this military clutch style pin back lapel pin is elegant, discreet, and an all-round excellent accessory to be had at a groundbreaking—that makes an even better souvenir. 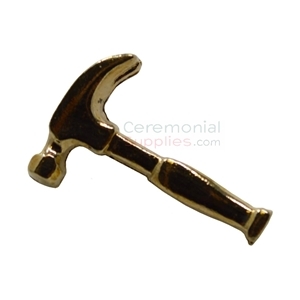 With a compact size measuring an inch and metallic finish, this miniature hammer lapel pin is an excellent keepsake when it comes to kick-off ceremonies for construction projects. 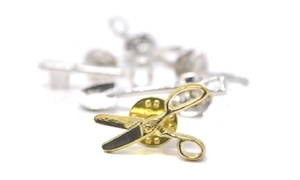 The lapel pin is available in either gold or silver color. 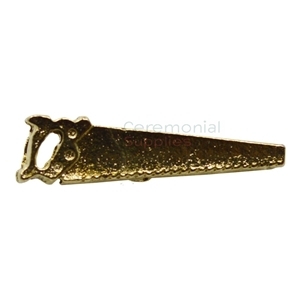 Measuring a compact 0.25 inch by 0.875 inches, this pewter cast gold finished lapel pin is an excellent fit for ceremonies celebrating construction kickoff ceremonies. A military clutch style back and an attractive saw like design make it a worthy keepsake for attendees. 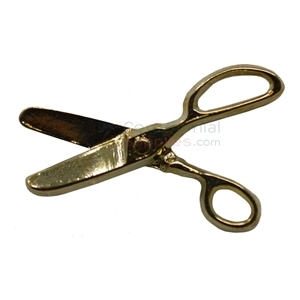 Ceremonial scissors pin has a shiny finish with military clutch snap pin back. 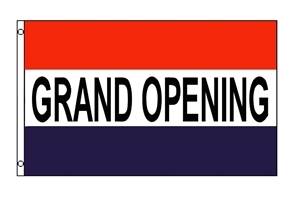 A perfect memento for grand openings and ribbon cutting ceremonies . Comes in size 1 1/8 x 3/4 inches. Color options include: Gold or Silver. The importance of aesthetic panache at a groundbreaking ceremony or a grand opening cannot be overstated. While you may have gotten some of the major ceremonial accessories and décor needed for your next event, there are countless product options that are still needed to put the finishing touch on your event. These kinds of groundbreaking and grand opening accessories are not as obvious as traditional ceremonial decorations and are more complementary in nature, enhancing the look of the showstoppers, or contributing to the overall ambience of the venue where your ceremony is being held. Ceremonial accessories and décor can range from general to specific, but they tend to be all-purpose accessories that can be used for all events with minimal modifications where called for. 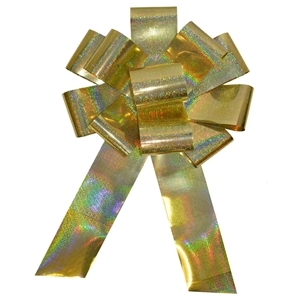 Bows are an excellent example of this trait. Ceremonial bows are traditionally larger than a regular one and more ornate in nature. It is not uncommon for a ceremonial bow to have a wire frame to retain its pre-assembled shape, while the material covering it provides a luxurious finish to it (such as satin or velvet). 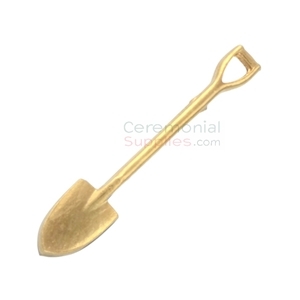 This adds versatility to the item, as a ceremonial bow can be classified as either a groundbreaking accessory or a grand opening one, depending on whether the bow adorns the ceremonial shovel at your groundbreaking or is placed on the main ribbon at your grand opening ceremony. Balloons play a similar role. Ceremonial balloons serve the same purpose as their regular counterparts, which is to add color to a ceremony, but with an added dimension. Ceremonial balloons are available in a pre-determined set of colors which have psychological connotations attached to them, so while the balloons are enlivening the venue, they are also projecting a certain image for the endeavor. Ceremonial balloons also feature text and designs printed in contrasting colors that usually the name of the event and it helps form visual associations for the attendees. Banners, signs and flags are essentially used for the same purpose, with all three of them available usually in a bold color palette with a high contrast design. This serves to catch the eye while the printed text emphatically proclaims and acknowledges the materialization of an ambitious dream. While all ceremonial accessories double as décor, there are some that serve a more functional purpose. 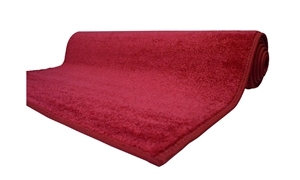 One of the most crucial purchases for any ceremonial event involving high profile individuals—especially if they are travelling a set distance on foot—is a quality red carpet. A red carpet or event runner is an expanse that marks the route to be taken by the dignitaries, guests, celebrities and generally every important person at an event. With time and the popularity of its usage in recent years, having a red carpet at your ceremony has become a must. 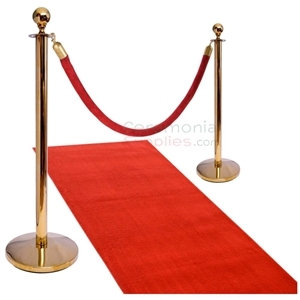 And while procuring a quality red carpet might be a coup, it’s still only one half of the job done, with the other half being arranging a set of appropriate stanchions and rope. 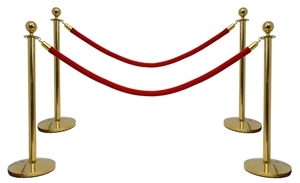 Stanchions are short poles placed on the sides of the red carpet and linked by a rope that control the crowds at events requiring the same. They serve as a means of preventing deviation from set route and keeping bystanders away from the ceremonial carpet path. 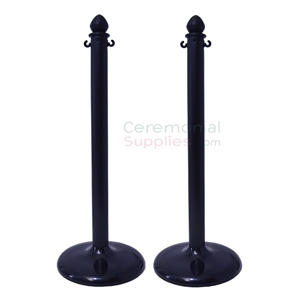 Stanchions are inherently versatile in nature, but can be divided into two categories, with one kind being used for aforesaid red carpet occasions, while the other being used for multiple ceremonies, weddings etc. The former category is usually a metal design with a high sheen polish while the latter adopts a plastic construction and a shade of black or white. These can also be employed as low-budget alternatives to meal stanchions or they can be used to complement the color schemes in ways that metallic stanchions cannot. 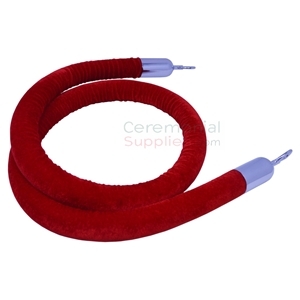 The ropes to be attached are chosen appropriately as well, with the former category being best suited for plush velour ropes, and the latter being most suitably complemented by body colored plastic chains. As visually interesting as these accessories might make a ceremony, nothing makes the participants remember a ceremony as well as a keepsake. 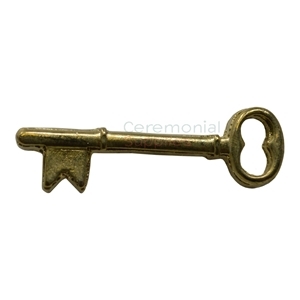 The perfect example of a ceremonial keepsake is a lapel pin. Lapel pins are wearable pins handed out to the attendees and ceremony’s participant. By wearing them, they show solidarity towards the cause to celebrate which the ceremony is being held. Post ceremony, the attendees keep the lapel pins and these continue to serve as a reminder of the ceremony and its grandeur. The problem of plenty is always a nice problem to have with the selection being so vast, you could never choose just one accessory. However, when it comes to ceremonial décor and ceremonial accessories, the problem of plenty is an asset! Since the accessories are so versatile, they could just as easily be a groundbreaking accessory as they are for grand openings. Stocking up on a wide variety of ceremonial décor and accessories is a prudent investment; we are here to help you with your budget. 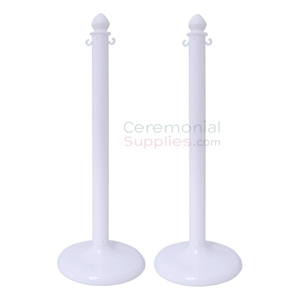 CeremonialSupplies.com maintains an impressive collection of aforesaid ceremonial accessories, and between the vast collection and an easy to navigate website, you’re only a click away from procuring all the right accessories for your next big ceremony.